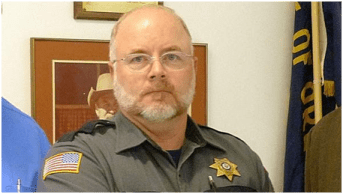 In the latest development involving the Burns-OR Standoff case, the Oregon Department of Public Safety Standards and Training is asking the state Department of Justice to investigate Grant County Sheriff Glenn Palmer after receiving numerous complaints from the public and others, including dispatchers and the John Day police chief. The Department has released eight separate complaints, including ones from a 911 manager and the John Day police chief, alleging misconduct by Palmer, and raising alarm concerning Palmer’s association with leaders of the refuge occupation. The Department of Justice has been asked to investigate the case, and the licensing agency has warned Palmer that if violations of police standards are found, he could face revocation of his police certification. I have a great public safety concern when the Grant County sheriff is allowed to openly meet with and be part of this group of lawbreakers,” said John Day Police Chief Richard Gray in his complaint. Glenn Palmer is viewed as a security leak, not only by local law enforcement staff but by the Oregon State Police and FBI. The article goes on to list verbatim quotes from anonymous complainants- and does not indicate whether the complainants are associated with or employed by BLM or other interested parties. The most interesting aspect of the Oregon Live article is what has been ‘intentionally’ left unsaid, unexplained, and plainly omitted. Nowhere in the article is there any mentioning of Sheriff Palmer’s highly public profile since 2013, his history of constitutional activism, or of his being a prime target of a never-solved bizarre bio-terror case. I would like to emphasize intentionally, since just a simple internet query under the news category on Sheriff Glenn Palmer brings up dozens of results that range from front page headlines to popular syndicated radio shows dating back to 2013. In fact, since Oregon Live has been the leading mainstream media outlet providing coverage on cases involving Sheriff Palmer, the query did not need to extend outside the publication’s own archives! I too, have taken the Oath of Office to defend and uphold the Constitution for the State of Oregon as well as the Constitution of the United States. I take my duty and responsibility seriously. The citizens of Grant County have entrusted and empowered me to represent them. We have a history with customs and cultures that will support and defend the Second Amendment as well as the Oregon Constitution. The Oath that I swore to is to support and defend our constitutions from enemies, both foreign and domestic. I will not tolerate nor will I permit any federal incursion within the exterior boundaries of Grant County, Oregon, where any type of gun control legislation aimed at disarming law abiding citizens is the goal or objective. Grant County Sheriff Glenn Palmer called it “borderline treasonous” to pass this bill, which he said would further impinge on gun rights. He said there was no way for law enforcement to know when private parties are involved in a gun transfer and said he had “no intention” of trying to enforce the provisions of the bill if it became law. Palmer won applause from the crowd, as did several other opponents who argued that legislators shouldn’t even be considering a bill they regarded as an unconstitutional infringement on gun rights. In February 2013 Palmer was one of four sheriffs from across the country who joined Glenn Beck on The Blaze TV to discuss the Second Amendment versus the push for more gun control legislation. Palmer’s opposition to the Obama Administration’s intense lobbying to speedily pass new gun control laws immediately following the Sandy Hook incident received extensive coverage- from The Examiner to The Washington Times and Breitbart Report. But most interestingly, most of the coverage of Sheriff Palmer was provided by Oregon Live. In 2015 the outspoken Grant County Sheriff became the subject of national media coverage again in a highly suspicious incident that was never truly solved. In July 2015 the FBI investigated at least 20 letters received by law enforcement agencies across Oregon after Sheriff Palmer was hospitalized following exposure to an unidentified white powder in an envelope. Palmer was exposed to an unknown “chemical substance” after opening a letter delivered to his office, and was hospitalized and treated after developing a rash caused by the substance. Yet, according to the FBI the suspicious letters sent to government offices throughout Oregon did not appear to contain any hazardous materials. This, despite the record of Sheriff Palmer’s hospitalization and treatment due to reaction from exposure to the suspicious envelope containing the unidentified substance. Palmer was one of three recipients who suffered actual physical reaction and a rash from exposure to the substance, requiring his hospitalization. Grant County Sheriff Glenn Palmer said one of the letters caused him to suffer a physical reaction. Palmer said he didn’t see any powder or white substance when he opened the letter, but he experienced a metallic taste in his mouth and felt a tingling in his arms. 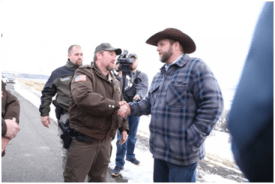 Harney County Sheriff Dave Ward, backed up by two other sheriffs, met face-to-face Thursday with protest leader Ammon Bundy to try to bring a peaceful end to a weeklong occupation of the Malheur National Wildlife Refuge. Ward was encouraged to reach out directly to the militants at a town hall meeting Wednesday night in Burns that drew an estimated 400 people. Several speakers urged the sheriff to do just what he did Thursday, and several ranchers had volunteered to join him if needed to end the occupation. Ward met Bundy on the side of Lava Bed Road, a handful of media surrounding the men. Bundy was accompanied by Ryan Payne, a self-styled militiaman from Montana. Palmer said he has spoken to Harney County Sheriff David Ward and told him he would not interfere without permission. Palmer said he has “a pretty good working relationship” with the sheriff from the neighboring county. He said, however, he was not willing to do the only thing Ward would allow. “About the only thing he really told me is I’m welcome to come down there if I would shame and humiliate them into giving up, and I said, ‘No, I won’t do that,’” Palmer said. “I’m not in the business of denouncing or shaming or humiliating anybody. But then again, it is apparent that Sheriff Ward has been a known guardian of BLM and subservient to the Feds, thus exempt from the ever-expanding Fed hit list. While the sheriff on the hit and grudge list has not been. Sheriff Palmer, in 2013, landed on the very wrong side of the Obama Administration and its Fed muscles with his unapologetic and highly public stand against the proposed disproportionate measures against the Second Amendment. That’s one. Sheriff Palmer was one of the prime targets in the mysterious case of envelopes containing a toxic substance mailed to Oregon law enforcement offices, which were handed over to the FBI for forensic investigation and never again saw the light of day. That’s one as well. Sheriff Palmer has been a strict constitutionalist- a proponent of the separation of powers, pro local authority vs federal intrusions, and a staunch defender of the sanctity of the Second Amendment. None of which is tolerated by the current federal powers. Any one enough to land him on the fed’s to-be-persecuted list. That’s definitely a one. Sheriff Palmer is now a direct target of the Federal Government’s witch-hunt, geared to set an example and destroy the last pockets of resistance and righteousness in the nation of the-no-longer-free. And that’s another one. I don’t know about you, but in my book the sum of the above ones equals a solid four. Now, someone please explain to me: How is it that a resourceful mainstream publication such as Oregon Live, which has an extensive and well-organized archive of its own news coverage for the last three years pertaining to Sheriff Palmer, publishes this recent one-sided article without even a single mention of the never-buried hatchet and long-held grudge by President Obama and the feds against the Sheriff? Publishes it without history, context and the real facts, that is. You tell me- because ‘they’ never do. Previous Previous post: Colorado Confirmation. These Trains are parked for a reason….